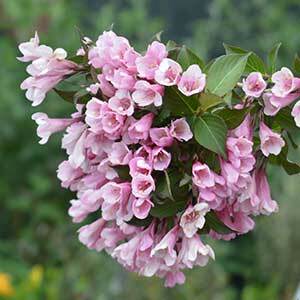 With purple to bronze foliage and mid to deep pink flowers, Weigela florida Foliis Purpureis is a plant that adds both flowers and foliage to the garden. Foliage colour does depend a little on position with the colour being more intense where the plant receives more sun. The flowers are trumpet shapes to around 5 cm long and appear in clusters from spring well into summer. This is a plant that flowers on long arching canes, so give it a position where it has the room to grow in its natural graceful habit. Excellent in the garden border, either used as a background plant or planted towards the format as a feature to break the lines. Best grown in a humus rich well drained soil in full sun to a little shade. In warmer climates try for a position with some afternoon shade. This is a frost tolerant plant and will reach around 1.5 – 2 metres in height with a similar spread. Mulch around the plant to help retain some moisture through summer. Best pruned after flowering. Simply deadhead as a tidy up each year. This will keep the attractive arching habit which adds to the appeal of the plant. After a few years you can prune back some of the oldest canes. Try about 1/3 each year and take them right back to the ground. This promotes strong new growth and better flowering.